Cybersecurity is one of the most critical issues in the tech world today and it is important that our employees develop the right skills and expertise that will continuously advance their capability to protect our systems and transform the industry. 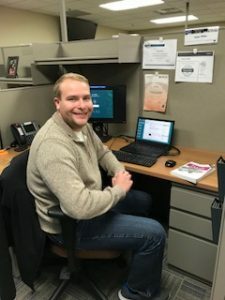 We spoke with William Hood, Isaac Ritter, and Brandon Wolfe about their experiences learning Cybersecurity as apprentices, in our IBM offices in Rocket Center, WV. What made you interested in the IBM Apprenticeship program? WH(left): I had hoped to get a job at IBM when I graduated from college, so when I was notified of the Apprenticeship program, it was perfect for me. 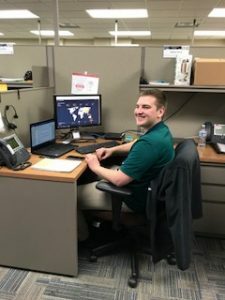 I’m able to work exactly where I wanted to and have the ability to learn and work with the other employees to ensure I have all the skills and knowledge needed for a career in cybersecurity. Interested in working at IBM? Stay connected by joining our Talent Network. What’s your job role, and what do you do on a daily basis? What education/life experiences prepared you for the apprenticeship? IR(right): I really cannot stress the value of teamwork enough. Our apprentice team is a very diverse group with a former missionary, a former FBI background checking specialist, a former professional poker player, and a 4.0 GPA cybersecurity grad from a local college. These guys are great, and each brings something to the table that I do not. Recognizing that has been the biggest contributor to the team’s success so far. Personally, my technical background comes from my military training in the United States Navy. My time serving has given me the people skills, foundational understanding, and work ethic to succeed as an apprentice. That said, it is a great feeling that everyone on my team along with everyone else in Managed Security Services has my back if I ever need anything. What is it like to be a cybersecurity apprentice? BW: It’s not completely a training role. The Security Operations Center is an active Environment and will require you to also sometimes take an active role. There will be taskings that require you to step out of the training environment. The group that was chosen has a widely varying background. Use each other to your advantage. What has been your favorite part of the IBM Apprenticeship program so far? WH: My favorite part of the IBM Apprenticeship so far is that I have been exposed to so much more than I had already learned throughout college and outside studying, from learning the tools that are used to help manage and secure Federal and DoD systems to how to conduct a tabletop Incident Response activity; there’s always something new to learn and new tasks to complete, which keeps the apprenticeship interesting. I also really like the other employees I work with, they have all been very friendly and helpful. The employees are always there to help answer any questions that we as apprentices may have without hesitation. What have you learned in the Managed Security Services Cyber Security Apprentice program? IR: During these first five months of the apprenticeship my team has had the great benefit of learning a diverse range of topics from leading security experts on the Managed Security Service’s team. One of the greatest aspects of this education has been the flexibility of the program. In addition to the subjects in the team’s curriculum, I have also attained three professional IT certifications, including CompTIA’s Security+. We have learned the inner workings of the security tools that SOC analysts and engineers utilize every day, best practices for Risk Management and mitigation of vulnerabilities, threat hunting and reporting in both a written report and digitally via a team podcast, compliance with federal legislation when securing devices and networks, python programming, and networking/configuration experience while setting up our own lab environment. What is it like working for Federal? IR: While the Federal clients of Managed Security Services require and demand the higher level of security which everyone within MSS works diligently to provide, there has not been one time I have been made to feel intimidated or like what all the SOC analysts and engineers do is beyond me or unreasonable. The work can certainly be intensive, and I witness firsthand the number of hours that go into making our client’s security a reality. Our management really makes a point of countering the workload by creating a calm, fun, and welcoming family environment within the SOC. What’s one piece of advice you’d offer to anyone thinking about the apprenticeship? WH: The advice I would give is to be ready and willing to learn more and more every day. The apprenticeship will open you up to a whole new world of knowledge and skills from the training and the individuals you work with. BW: The greatest tip I could give to those interested is to do your research into the field. Figure out the ideal outcome for you after the Apprenticeship is complete. Search the job market and see the opportunities that this training will yield with IBM. For example, how many Rocket Center jobs are listed in Cyber right now? What are your top three tips for future apprentices? Want to learn more about our apprenticeship program, our various apprenticeship opportunities, or apply to join us? Visit the IBM New Collar Apprenticeship site.